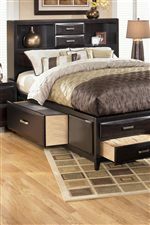 Maximize the storage in your youth bedroom with this stylish contemporary bed with four storage drawers in the footboard, one side rail drawer, and two shelves and two drawers in the bookcase headboard. The almost black look and bronze colored hardware create a sleek look. You'll find room for linens, clothing, shoes, and much more in this great storage bed. The Kira Full Storage Bed by Ashley Furniture at AHFA in the area. Product availability may vary. Contact us for the most current availability on this product. 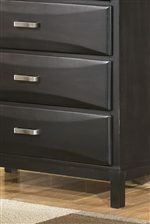 B473-74 Full Storage Footboard w/ Drawer 1 58" 3" 22"
B473-77 Full Storage Headboard w/ Drawer 1 58" 11" 55"
B473-88 Full Storage Rails/Slats/Drawer 1 59" 76" 22"
Storage 4 Footboard Storage Drawers, 1 Side Rail Drawer, 2 Open Shelves and 2 Drawers in Headboard.